How will I know if it's working...? ... sees herself as the primary and most important judge of her own accomplishments. And what would be some signs that really would mean things aren't working out right? Hmmm. I think one sign would be if it felt like our lives were continual chaos and we spent our time running frantically to one activity after another. (I'm worried about my own ability to keep us to some kind of vaguely-structured routine, so this is one way I can see things going off the rails.) I'll keep thinking about this one, because I'm sure my family will ask. 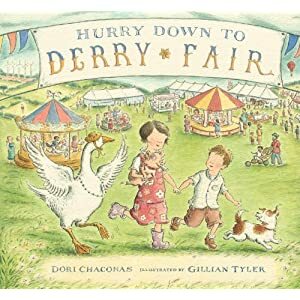 Hurry Down to Derry Fair was just a sweet story with lovely illustrations. It's about a little boy who is bubbling over with excitement about his family's trip to their local fair, but finds himself having to wait for his mother to finish baking pies, for his sister to finish preparing her pets, and for his father to finish chopping wood. Finally, his grandmother takes pity on him, and off they go! The last page is a fold-out illustration of the whole fair at one glance, and the reader can look for the boy and all his family to see what they're doing at the fair. It's hard to say much about this book other than it has delightful illustrations and a sweet but simple plot, but if your child (like Basbusa) just loves fairs in any case, it's certainly a very enjoyable read! Much as Basbusa enjoyed Neville, I think the main point of the plot was actually a bit over her head. The story is about a boy who has to move to a new neighborhood, and is sure he'll be miserable, with no friends and a new school. But while out on a dispirited walk to explore his new neighborhood, he gets an idea: he starts calling for "Neville!" at the top of his voice. Gradually other children join in to help, and to help each other help, and eventually the boy is at the middle of a whole group of cheerfully yelling children. The kids soon start asking about Neville, what he likes to play and whether he's nice, and sound very interested in getting to know him. They never find him, but agree to meet up the next day to keep looking. It turns out, after the boy has gone home delighted with all the kids he's met in his new neighborhood, that the boy himself is Neville. How much of this plot did Basbusa get? Well, she got that all the kids were looking for someone called Neville. I tried a few times to explain that this was the boy's smart way of making new friends, but she didn't really get it, and I didn't want to spoil her enjoyment of the story by insisting on full comprehension :) Which left me wondering why exactly she liked it so much, given that her version of the plot was really pretty thin! 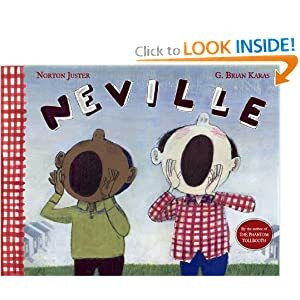 She liked the kids' attempts to yell as LOUD AS THEY POSSIBLY COULD, and she liked how different fonts and colors were used to show the different kinds of "Neville! "s for each kid. Other than that, I think the big draw was simply that it was an example of group dynamics and kids interacting. She seems fascinated with the details of social interactions these days. I'd definitely recommend this book for a slightly older child who was able to sympathize better with a child's worry over making new friends. Just one note - there was one sentence I always skipped, in which Neville gloomily anticipates that all the kids (and the teacher!) in his new school will make fun of him and be mean to him because he's new. Basbusa hasn't yet figured out that kids can intentionally say hurtful things, and I'm not in any rush to heighten her awareness. 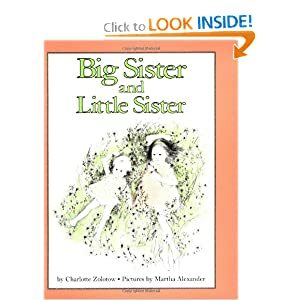 I read Big Sister and Little Sister at some point during my own childhood, but had long forgotten the name of the book, and I don't think I ever knew the name of the author. Fond memories of the story were all that remained. But I was so glad to stumble across it again, for my own sake as well as for Basbusa's! It's the story of two sisters who are love each other very much, but whose relationship is beginning to change: the Little Sister starts to feel that she doesn't need to be taken care of so much, and that she'd like to try a little more independence. So she secretly goes off to hide in the meadow by herself - only to discover that her lonely and worried Big Sister also cries sometimes, and also needs to be comforted. From that day on, both sisters took care of each other, "because Little Sister had learned from Big Sister, and now they both knew how." Such a sweet story, and an idyllic model of the relationship between sisters. Basbusa enjoyed it many times over, and I hope she and her own little sister will always be as close as the girls in the book! 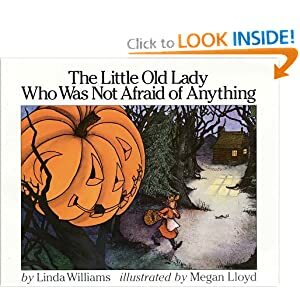 The Little Old Lady Who Was Not Afraid of Anything is clearly way out of season, since it's a Halloween book. We ordered it around Halloween, but were at the very end of a long list of requesters at the library, so Halloween was long over by the time it was our turn. That didn't bother Basbusa, though! 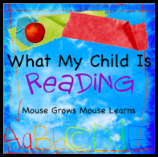 She read this one over and over again, and since the text is repetitive, she soon had it memorized and could "read" it to herself with no help. It's a tale of a little old lady who is pursued through the forest by a pair of shoes, a pair of pants, a shirt, a pair of gloves, a top hat, and ultimately a big scary orange pumpkin head. She bravely defies them until a BOO! from the pumpkin finally breaks her nerve - but she soon comes up with a good solution for herself and for the scare-happy clothes. We'll make sure to get to the top of the list for this one next October! I saw Library Lion recommended over at Supratentorial, and we absolutely loved it. 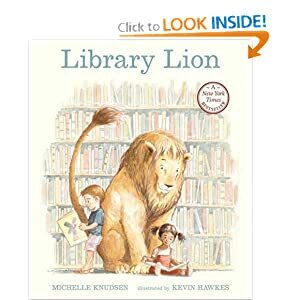 It's the story of a lion who wanders into a library, and, entranced by the stories and books, soon makes himself at home - until, in an attempt to help his friend the head librarian, he gets banished from his beloved library. All turns out well in the end, but along the way there's a touching story about friendship, a discussion of the power of rules and regulations, and, of course, the joy of libraries. We go to the library maybe four or five days a week, so that's a message we can sympathize with! Basbusa and I both loved this one, so we also checked out a new book by the same author, Argus. It was ok, but nowhere near as charming, in my opinion. Basbusa liked it, but didn't ask for endless re-reads. 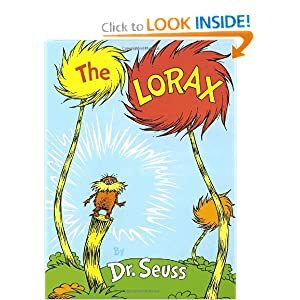 I can't remember where I saw The Lorax recommended, but I would never have gone browsing through the Dr. Seuss shelf spontaneously. Dr. Seuss wasn't huge in Ireland when I was a child - we had The Cat in the Hat, but that was it, as far as I can remember. More recently, I had glanced through some other titles in our library, but wasn't wild about them, and assumed that The Cat must have been the pinnacle of the author's work. Oh my goodness, how wrong could I have been? We loved the Lorax. Basbusa still spontaneously recites bits of it (at least a month after we returned the book to the library), and refers to "gluppity glup and shloppity shlop" quite matter-of-factly when encountering goo in everyday life :) The story - just in case there are others besides me who have happened to miss this one - tells the tale of a nefarious Once-ler, who gradually chops down a whole forest of Truffula Trees in his quest to make himself rich selling thneeds, despite the vociferous protests of that friend and guardian of trees and barbaloots, the Lorax. It's a light but thoroughly heart-felt introduction to the idea of industrial pollution through an exciting and engaging story, told in poetry that rises to a level far above that of the well-known but well-worn Cat. 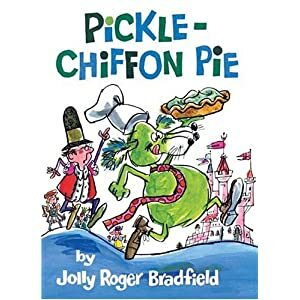 Pickle-Chiffon Pie was an accidental library find, and it was one of the most enjoyable once-upon-a-time stories we've read so far. The plot is the fairytale classic of three princes competing to win the hand of a beautiful princess, but the imaginative nature of the illustrations and of the competition itself - to find the most unusual thing in a very unusual forest - make the story both delightful and funny. Prince Bernard is initially certain that he will beat Princes Musselbaum and Wellred with his discovery of a Three-Nosed Snozzle who knows how to make the king's favorite dish, pickle-chiffon pie. But then he spots three baby Snozzles, hiding behind the trees while he leads their father (mother?) away, and can't bring himself to split up the happy Snozzle family. Of course, the tale ends up with a happily-ever-after, along with rewards for thoughtfulness and kindness. My Name is Elizabeth was a favorite of Basbusa's right from the first reading. Elizabeth likes her name, and strongly objects to being called Beth, Lizzy, or any other variation of it. Basbusa could easily sympathize with her frustration, because Basbusa strongly prefers her own nickname, but finds people continually choosing to use her "real" name instead. 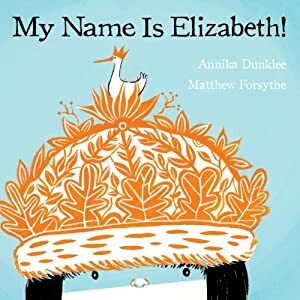 She liked the story for its own sake, but I think she also liked seeing how Elizabeth eventually spoke up, and told people what she liked being called - and finding that everybody quite happily complied with her request. This book also served as a vehicle for explaining the difference between speech-bubbles and thought-bubbles, a concept which Basbusa found very interesting. 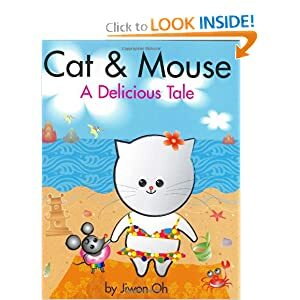 Cat & Mouse: A Delicious Tale was slightly odd in terms of plot - after browsing through a recipe book, a cat suddenly finds herself unable to stop thinking about how much she wants to eat her best friend, a mouse - but Basbusa enjoyed it. I think she just interpreted it as another version of the very familiar I-really-want-to-but-I-know-I-shouldn't conflict, and didn't stop to ponder the issue of best friends eating each other :) The graphics made an interesting change from the usual, too, and the book ended up with a reassuringly positive affirmation of the power of true friendship. Oh, and Basbusa learned what the '&' symbol means. So, odd but worthwhile, overall. We had a cute misunderstanding with this one, too. Basbusa hadn't come across the term "dust bunnies" before, so I told her that it meant bits of dust and fluff stuck together, but explained that in real life of course they would be mostly dust-colored, not red and green and purple. A few days later, she came running to me, saying, "Mama! Mama! I found some dust bunnies!! 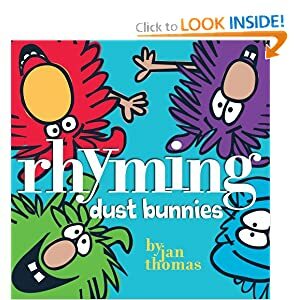 ... but I think they're dead..." :) Oooops, guess I should also have clarified that dust bunnies aren't alive like the ones in the book, either! 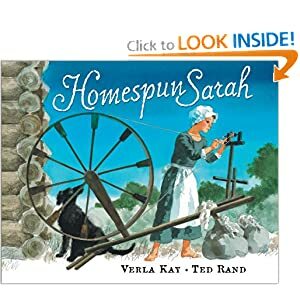 Homespun Sarah was a recommendation from Amy at Hope Is The Word, and Basbusa and I both liked it and learned a lot from it. It describes life in colonial Pennsylvania from the point of view of Sarah, a young girl living in a typical family. I thought the book managed to convey a huge amount of information about what life was like, in the most enjoyable of ways. Did you know, for example, that in the colonial period, only the adults were allowed to sit down at the table to eat? The children all had to stand, and had to remain completely silent during the meal. The book is told in rhyme, and the text is a little awkward at times, but it didn't cause us any difficulties. 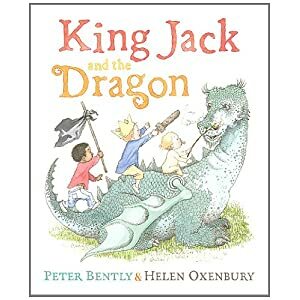 King Jack and the Dragon was a story about three young boys building a fort out of boxes and old sheets, and having a day full of imaginary adventures defending it. The oldest (still a preschooler) bravely plans to stay out all night, but becomes more and more nervous by the sounds of pattering mouse-feet and a distant owl-call. In the end, when a huge, four-footed shadow approaches the fort, he loses his nerve completely - but it's only his mum and dad coming to take him to bed. It was a beautiful story, and it was told in rhyme, so Basbusa did enjoy it. I think it's maybe just a little bit young for her, though, because it never did make the read-over-and-over-and-over list. In the interests of managing to post more regularly, I'm going to keep it down to just three or four books per post. How I'll ever catch up with my to-be-blogged-about list is another question, but it's better than not posting at all! First up for this week is The Adventures of Taxi Dog. 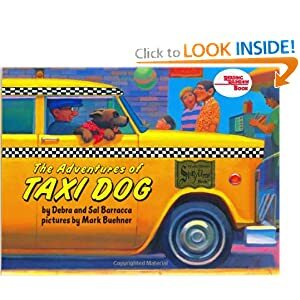 It's a story in rhyme about a homeless dog who is adopted by a cab driver in New York City, and then spends her time riding around with him in his taxi. It's a nice story, and Basbusa loves almost anything in rhyme. The illustrations are attractive, and there are things to look for, like the black cat who shows up in every page somewhere. But what really made this book special for us is that it's the first book my two girls enjoyed together. Basbusa's little sister - hmmm, she needs a name for the blog... let's pick another Egyptian dessert... how about Kunafa? - is 14 months old, and adores dogs. She loved pointing to the dog on each page, and woof-woofing earnestly. Why this book in particular caught her interest, I'm not sure, but it made for some very sweet read-aloud moments. Duck Duck Moose was one of Basbusa's own picks from the library, and I'm so glad she found it! It was our first book by Dave Horowitz, and we all loved it. 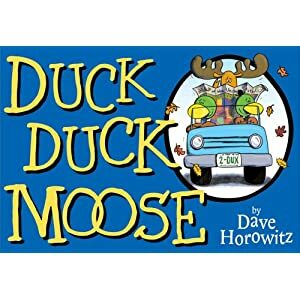 It's about a New Hampshire moose who decides to migrate south to Florida for the winter with two ducky friends.It's hard to describe why the book was so successful, because not too much happens in terms of plot besides going to Florida and coming back again. But somehow, despite the minimal text (great for beginning readers), each of the three characters has a personality that shines through. There's humor that was targeted at just the right level for Basbusa, and Kunafa was intrigued by the "moooooooooooooooose," as she kept pointing out to us, waggling her hands by her head for antlers. T'his would be a great book to do FIAR-ish activities with, if you're into that. We pulled out our maps right away to trace their route ("'Hey,' said Duck, 'I see New York City!' 'Hey,' said Other Duck, 'I see Washington, D.C.!' 'Hey,' said Moose, 'I've gotta pee!'" Cue much giggling from Basbusa.) Lots to contrast between NH and Florida, discussion of seasons and hibernation and migration, etc. We checked out some other books by the same author, but none of them were quite such a hit, though we did enjoy Humpty Dumpty Climbs Again. 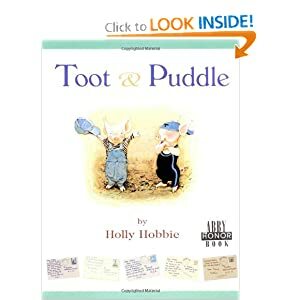 Last up, Toot and Puddle, which was similar to Duck Duck Moose in being a travel-centered story without vast amounts of plot, but totally different in style and illustration. It's just the story of two pigs, one who goes on a trip around the world, and the other who stays at home in Woodcock Pocket. Each month, Toot sends a postcard home to Puddle, showing a glimpse of his exotic adventures, while Puddle enjoys the closer-to-home joys of each season. The illustrations are charming, and I loved how the two pigs had such a close friendship despite their different tastes. Basbusa really enjoyed it, and we did some more map-hunting to follow Toot's adventures. We checked out some of the sequels, and they were ok, but not as delightful as the original, in either of our opinions.